One of the big questions commonly asked of Calvinists is how they reconcile their soteriology with the Bible’s exhortations to evangelize. There are many different angles from which Calvinists approach this issue, but ultimately, they will unanimously end up hitting on the big one: we are commanded to evangelize. The same is true for giving. We give because we are commanded to give in the Bible. In 1Corinthians 16:1-2, Paul orders the church in Corinth to regularly take up offerings on the Lord’s Day. He had not only given this command to the church at Corinth, but had also given it to the churches in Galatia. The specific occasion for this command was a famine that had come upon the church in Jerusalem, but notice that Paul does not have them take up a one-time “love offering” to help meet the need in Jerusalem. Rather, he had them take up regular offerings. This was so that the flock would not be pressed for funds when he came to them to collect the money. Rather, out of their regular givings, they would have compiled a large sum that they would have been unlikely to raise with a single offering. The work of the church requires regular giving. Churches cannot function without it. “And do not neglect doing good and sharing, for with such sacrifices God is pleased.” (Hebrews 13:16; NASB). Such doing good and sharing is reminiscent of the early church in Acts 2 who shared all things in common and gave to anyone as he had need (vv. 44-45). So, if anyone asks why we should give, there may be many answers we can give. However, if all those were to fall by the wayside, we would still have the command given us in Scripture. Let us not withhold our gifts from the Lord who has so graciously given all things to us. Another issue that was raised in our discussions about giving was the fact that pretty much any sermon you will find on subject of giving will inevitably make reference to the fact that giving in the Bible is an act of worship. In Matthew 6:1-4, Jesus gives instructions on worship through giving. He instructs those listening to His sermon to give in such a way that only they and God know how much was given. The point is that the gift is meant to be a theocentric act, not an act to draw attention upon oneself. We give out of worship toward God, not out of a desire to bring glory to ourselves. This was the sin of Ananias and Sapphira. Ananias and Sapphira, having seen that others like Joseph of Cyprus (Acts 4:36-37) were selling land and giving to God, sold their land and gave only a portion of the proceeds. When they brought the portion to the apostles, they were asked why they lied. The land belonged to them, Peter said. As long as they owned it, it was theirs with which they could do what they wanted. They chose to sell the property and give some of the proceeds from it in order to bring glory to themselves (Acts 5:1-16). The act of giving is an act of worship to God, not to self. 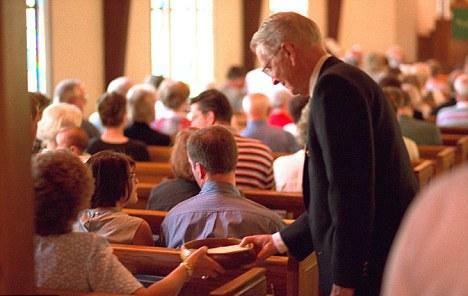 Before we decided to include giving in the order of worship, we had always had an offering box in the back of the room. This box made giving the only act of worship at our church that was not included in the order of worship. It took the corporate sense out of this one act of worship and made it individualistic. Thus, I and others argued that, if we were going to call giving an act of worship, it should be included in the corporate worship service. In the next article, I will discuss three more arguments for giving in the order of worship: giving as a teaching tool (for our children), giving as a blessing to the giver, and giving as an act of stewardship.